If you like to water-ski with your PWC, this optional coverage is perfect for you. 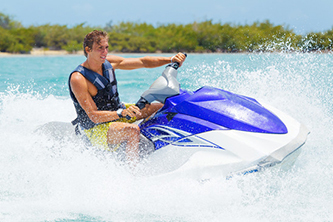 Many of our insurance companies have policy options to help pay medical expenses for boating injuries, with the option to increase the coverage limit to better suit your needs. The optional coverage protects the trailer you use to tow your PWC. This optional protection includes the following coverage’s. Provides bodily injury protection to you if another boater collides with the PWC you are operating and that boater is not insured. Extends your policy’s liability coverage to most PWC’s you rent or borrow. Provides help in the event your PWC breaks down on the water or your trailer breaks down while you’re transporting your PWC. Covers the important personal belongings you store on board from theft and damage.